One of the things we love the most about being expats and living overseas is the opportunity to explore deeply our new home. Camping is a great budget way to see a lot of places and we love spending time in National Parks. In our time living in Melbourne, we camp at least once a month in the summer months and have been fortunate to explore the best campsites near Melbourne. Victoria is a vast state and there are many amazing spots further out from Melbourne that we haven’t had the chance to explore yet. All of these recommendations are within a 4 hours drive from Melbourne, with many of them being only a couple of hours away. We feel happiest when we are at a campsite in a National Park, but we also suggest some great caravan parks too. So if you want a weekend away from Melbourne or a week away, here are my suggestions for the 7 best campsites near Melbourne. Remember that during Christmas, New Years and January school holidays, campsites need to be booked well in advance. Many National Parks have a lottery for this time period which needs to be entered in winter. 1.8.1 Enjoyed Reading this Post? SIGN UP for more. This is one of Victoria’s most-loved National Parks, located in Gippsland, 3 hours east from Melbourne. This large coastal park feels remote and offers pristine beaches, excellent hiking and a tidal river to explore. While we absolutely love this National Park, we wish the main campground at Tidal River was a bit smaller and more peaceful. There are good facilities, but sites are expensive at over $60/night. A lot of the sites feel like they are on one large car park, but there are some better sites with more privacy. Use this map to select your site if you are visiting outside the peak period. That being said, we still love this campsite and the the convenience of being so close to Norman Beach and the tidal river. This is also a sure fire place to spot wombats at night. Sadly, fires are prohibited. The Tidal River campground also has cabins if you prefer. Outside of the park boundaries, there are a number of B&Bs and small inns. This is another one of Victorian’s favourite parks and one of the best campsites near Melbourne. It is located 3 hours west of Melbourne and is best known for its mountain ranges loved by hikers and rock climbers. You can stay in the closest town of Hall’s Gap or stay right in the National Park at a number of campsites. We love the convenience of staying at Smiths Mill where you can easily get to the most popular walks and sites in the park. The facilities are basic (drop toilets), but new and clean and we were delighted to be visited by the emus in the area. You can have fires here, just bring your own firewood. Make sure you do the Pinnacles hike, visit the Balconies and see Mackenzie Falls. If you prefer a bit more facilities, Halls Gap Lakeside Tourist Park is the best caravan park in the area. You get great amenities and emus and kangaroos in the evening. You will just be on the edge of the National Park with easy access to the most popular hikes and viewpoints. The excellent Brambuk Aboriginal Cultural Centre is located in Hall’s Gap and is a must-visit. Mount Buffalo is in Victoria’s alpine region, also known as the Australian Alps. Located 3 1/2 hours from Melbourne, the area offers Victoria’s highest peaks, cute towns with lovely vineyards and cafes and beautiful colours in autumn. We have stayed in the National Park campgrounds and in Bright and Porepunkah at caravan parks and both are excellent options. If you are after bush walking and tranquility, choose to camp at Lake Catani in the National Park. This is one of our favourite campgrounds because it is set right on a lovely lake with snow gums and interesting rock features. The campsites are private and some even have views of the lake. The amenities are excellent (flush toilets and hot showers), but you will pay for these added facilities. We also love that you can have a fire in the shared fireplaces (you can purchase firewood at the campground). The campsite is about a 45-minute drive from Bright. You will need to be self sufficient with water, but you can pick up basic supplies at Dingo Dell lodge. There are so many great walks in the park. Some of our favourites are Chalwell Galleries (from the campground and includes some scrambles), the Gorge Heritage Walk, the Underground River, Monolith Track and Cathedral Hump. Watching sunset from the Horn is amazing and the waterfall tracks are great as well. If you want to enjoy the quaint town of Bright, stay at the Bright Big 4. You will have all the amenities of a Big 4 in an excellent location right on the Ovens River in the centre of Bright. Kids and adults can play in the river where the Rotary Club has a slide and diving board with lifeguards at holiday times. The splash park and riverside playground will keep the kids busy while the adults will enjoy Bright Brewery. 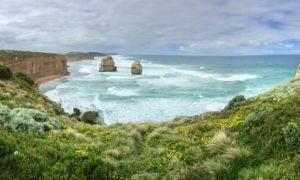 Victoria is home to the spectacular Great Ocean Road and one of Melbournians favourite places to get away. 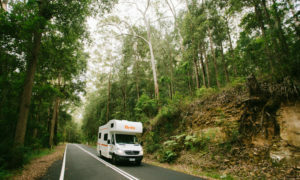 There are a few caravan parks and council foreshore parks along the route, but our favourite place to stay is Great Otway National Park. This large National Park is best known for its rugged coastline, beaches, waterfalls and temperate rain forest. 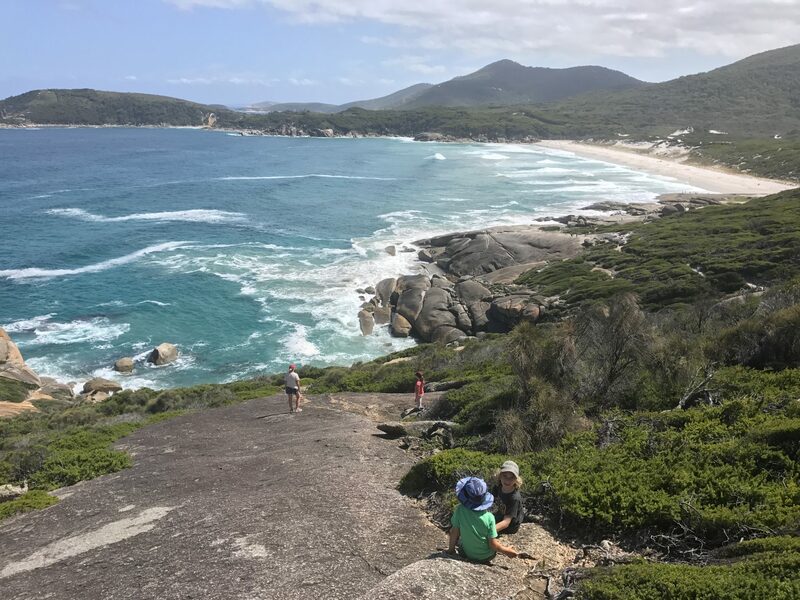 Located 3 hours southwest of Melbourne, our favourite campsite is Blanket Bay where most sites have views of the ocean and beach. The Great Ocean Walk goes right through the campground and this truly is a spectacular stretch of coastline. Facilities are basic and you will need to bring your own water. There are shared fireplaces (bring your own wood). This is one of the best places to spot koalas in the wild. We saw them in the trees above our campground and on the hikes along the coast, but Lighthouse Road is a sure-fire place to see them. If you are looking for more facilities, we suggest the Big 4 Apollo Bay Pisces Holiday Park. Set right across the street from the gorgeous Apollo Bay beach, you are right beside Great Otway National Park. When we first moved to Melbourne, I thought Phillip Island was just the place that people went to see the little fairy penguins come ashore. This island, 90 minutes from Melbourne offers so much more and makes for a great weekend getaway. Phillip Island Nature Parks operates the nightly Penguin Parade, as well as historic Churchill Island, the Koala Conservation Centre and Antarctic Journey. On top of these great eco-attractions, the island’s beaches and coastal reserves are great places to explore. There isn’t a National Park on the island, making a caravan park the best option for campers. 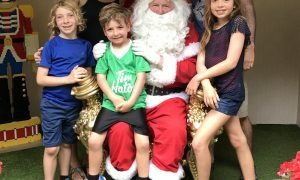 We stayed at the Big 4 Phillip Island, where the kids enjoyed the amenities and the adults enjoyed the close proximity to the beach. The Mornington Peninsula is just a short escape out of Melbourne (1+ hour) and allows you to enjoy the protected waters of Port Phillip Bay, the ocean beaches, the wineries and many great attractions of the area. There aren’t any wilderness camping options at the Mornington Peninsula. You can choose between a number of caravan parks or the council foreshore caravan parks in the summer months. We really like the Stringer campground, near Blairgowrie, run by White Cliffs Foreshore Reserve. While the campsite is crammed and right beside the main road, you can stumble out to the calm waters of Port Phillip Bay. It makes a great base to explore the region, both the towns, beaches and parkland areas. For a completely different camping experience, head north to the Murray River. You can expect it to be a few degrees warmer here than Melbourne and there are great options for bush camping and caravan parks. We really like the historic town of Echuca on the New South Wales border, 3 hours north of Melbourne. Parts of the town feel frozen in time and the old riverboats that ply the river are a great way to experience the area. In fact, this was our very first camping trip we took in Australia. We stayed at the Echuca Discovery Parks, located right on the Murray. We loved the cockatoos, indoor pool, jumping pillow and pump track. If you are looking for more of a wilderness experience, Barmah Lakes, Ulpuna Island and Mathoura are great bush camping options that have fireplaces and toilets. I am going to share with you another campsite we discovered that is a bit further from Melbourne, just over 5 hours away. Cape Conran is a coastal reserve on 90 Mile Beach in Gippsland. We had never heard of it until friends proclaimed it was their favourite campground in all of Victoria. We had to check it out and can definitely attest to it being a special place. The large campsites with individual fireplaces are a short stroll from a beautiful and quiet beach. There are flush toilets and cold showers, but you need to bring your own water. We saw wallabies and goanas at our campsite and loved exploring the tidal pools. If you are up for a longer drive, check out Cape Conran. What is your favourite campsite near Melbourne? Did you find this useful? PIN it to Pinterest. Love this list. That’s great you try and go once a month. We really only get to camp over the long weekends. 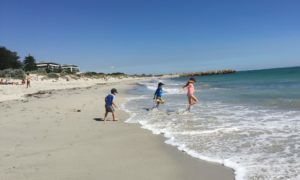 We went to Cape Conran and the surrounding areas before kids – I’ll have to word up our friends that we need to get down there again! !